Who wouldn't like to spend the winter in Hawaii? 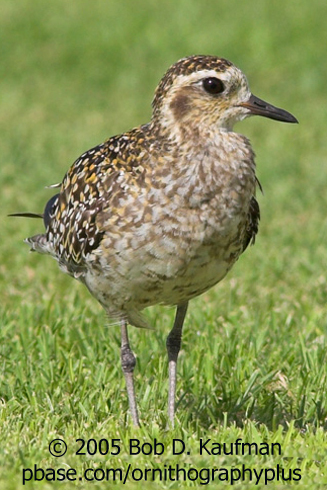 In September, a Pacific Golden-Plover wings its way toward the Hawaiian Islands, where it will spend the winter. Its wings span a full two feet. The plover fueled up for migration by plucking summer berries from its Alaskan tundra breeding grounds, storing fat for its 2500-mile flight. After 48 hours of steady flying, at an average speed of 50 miles per hour, the plover will touch down softly on the grassy slopes of Mauna Kea, the huge extinct volcano on the Big Island of Hawaii – where this photo was taken! There is a kind of terrible freedom in this delicate yet powerful bird’s journey. Striking out across the vast ocean, with nowhere to stop and rest, it has no choice but to head straight on for its island landfall. After 48 hours of steady flying, at an average speed of 50 miles per hour, the five-ounce plover touches down softly on the grassy slopes of Mauna Kea, the huge extinct volcano on the Big Island of Hawaii. How often in our lives do we face the necessity of the go-for-broke self-reliance that the Pacific Golden-Plover achieves twice a year? Call of the Pacific Golden-Plover provided by The Macaulay Library at the Cornell Lab of Ornithology, Ithaca, New York. Recorded by W. Ward and H.D. Pratt. Ambient recorded by G.F. Budney.